When Breanna Bisch moved to Panama City Beach two years ago, she didn’t know she would redefine street style. 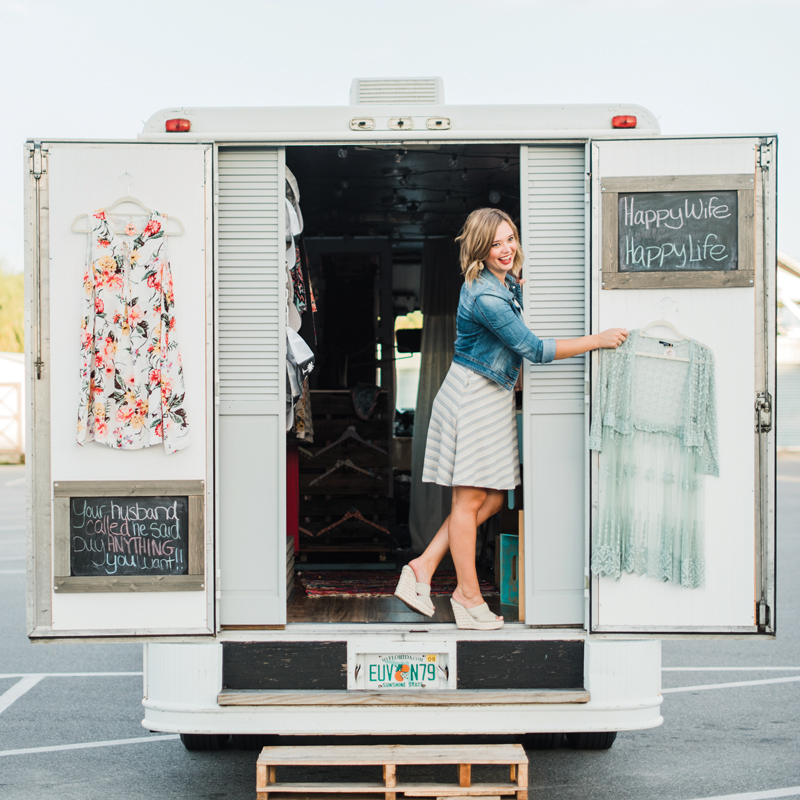 Owner of BB Lane, a traveling boutique, Bisch loads her smocks, frocks and heels into a florally decaled box truck. Its destination? The Grand Lagoon Farmer’s Market, local festivals and your driveway, to name a few. “I’ve always been a free spirit,” Bisch admits. The idea stemmed from a traveling boutique that was just revving up in Bisch’s hometown of Springfield, Illinois. It was there she obtained a cosmetology license at the University of Spa & Cosmetology Arts, because she had long aspired to be a professional hair stylist. While she flourished as a shift leader at a Springfield salon for a while, the Prairie State’s monotonous winters began to dull her shine. She and husband D.J. Bisch, flew south to Panama City Beach less than two days after they tied the knot in 2016. The couple had vacationed there for years and knew the Florida sun would ensure they thrived. As neither Breanna nor D.J. had yet secured a job, diving into entrepreneurship was, well, scary. “Once we had the truck, I didn’t know where to go from there,” she recalled. Mom also gets credit for Bisch’s own fashion sense, as well as the styles you’ll find on the racks of BB Lane. “There are a lot of women in my life whom I look up to. The relationship that you build with someone influences your fashion, too,” she said. All of them led with beauty and grace, so you won’t necessarily find the most avant-garde, edgy pieces within the truck. Conservative, classic polish reigns here, providing something for the whole family. “When moms and daughters can shop together, it’s a great experience,” Bisch said. It means offering plenty of variety. While other boutiques may limit their selections to coastal-casual wear or dressy apparel, Bisch is always on the lookout for versatility. “When you’re on vacation, you want to dress for the beach, but when you go back home, I want you to still be able to wear what you bought, no matter where you’re from,” she said. That’s not to say seaside living hasn’t influenced Bisch and BB Lane’s style. In Illinois, summers were static as far as temperature and humidity went. So long as you layered — and had a tank top to which to ›› strip down — you could successfully combat the heat. Dog days here, she said, are a different story. “I’ve completely shifted to lightweight, airy fashion that you don’t have to layer,” Bisch said. Those opportunities are found in the numerous festivals and private events that dot the coast, and BB Lane is always eager to make the trip. Some of the most memorable expeditions have traversed the grounds of the Junior League of Panama City’s Holly Fair, the Boggy Bayou Mullet Festival and North Florida Wildflower Festival in Blountstown. “I love the fact that I never have to stay in one place. I’m always booking different events and can set up my own hours,” she said. Bisch doesn’t ever think she’ll go the route of a traditional, brick and mortar store. Her passion lies in the unique experience. “The truck is only 100 square feet, so when a family comes in, it’s almost private,” she said.